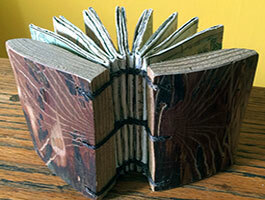 A lovely article in the UC Berkeley Library News about book artist Lauri Twitchell (also manager of the Blake Garden). Berkeley, California: redstartstudio, 2018. One-of-a-Kind. 5 x 6 x 7" double-sided accordion. Collage. Bound in wooden boards. Cloth wrap with tie closure. 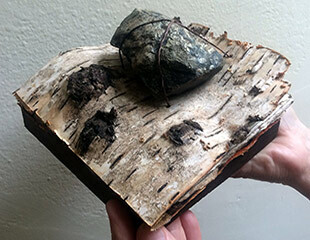 Materials: birch bark, glaucophane schist, cotton paper, ink, metal, redwood, hemp. 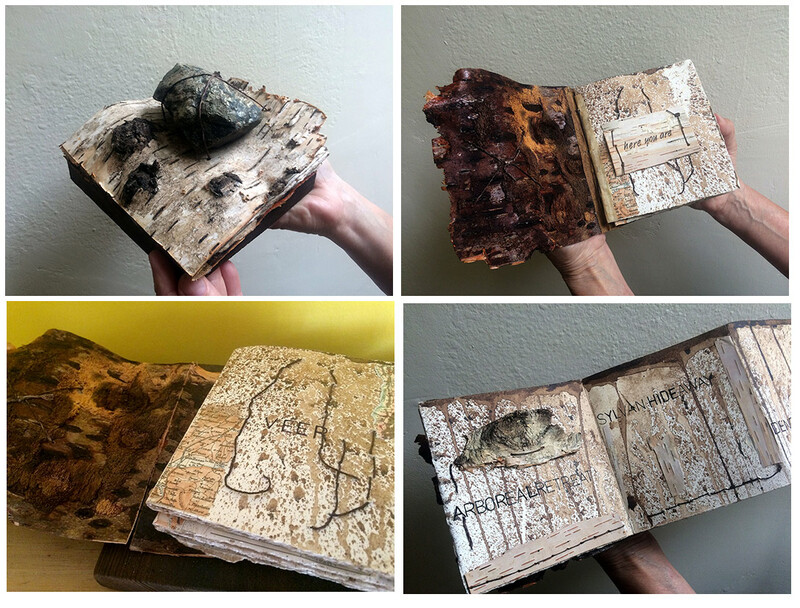 Lauri Twitchell: "As you turn the pages you wander through a drawn and collaged landscape with text of a calming mantra as each page contains different synonyms for 'wooded sanctuary.' On the other side you travel through synonyms for 'wander' collaged with old travel guide maps." 4 x 5.25 x 3"; 8 fold-out pages. 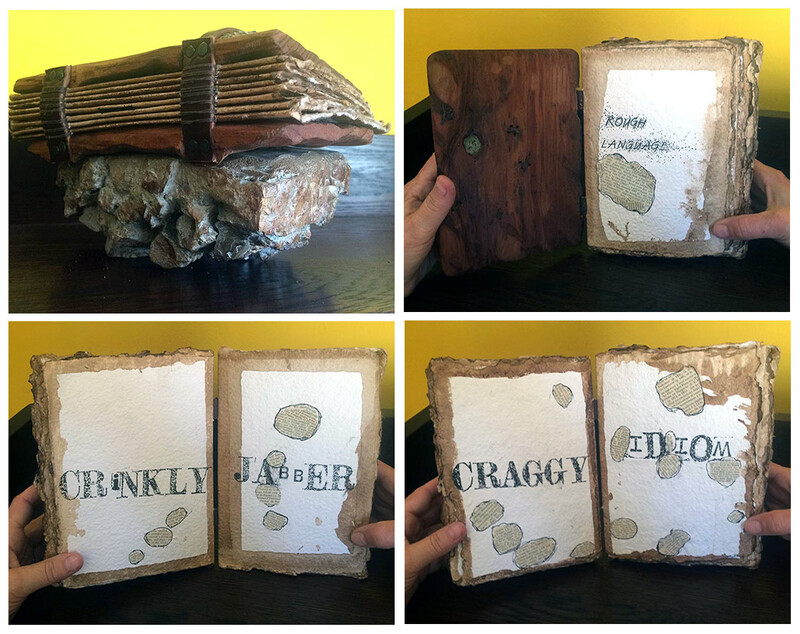 Materials: ceramic, cotton, ink, collage, wood, world map fragments, travel book pages. 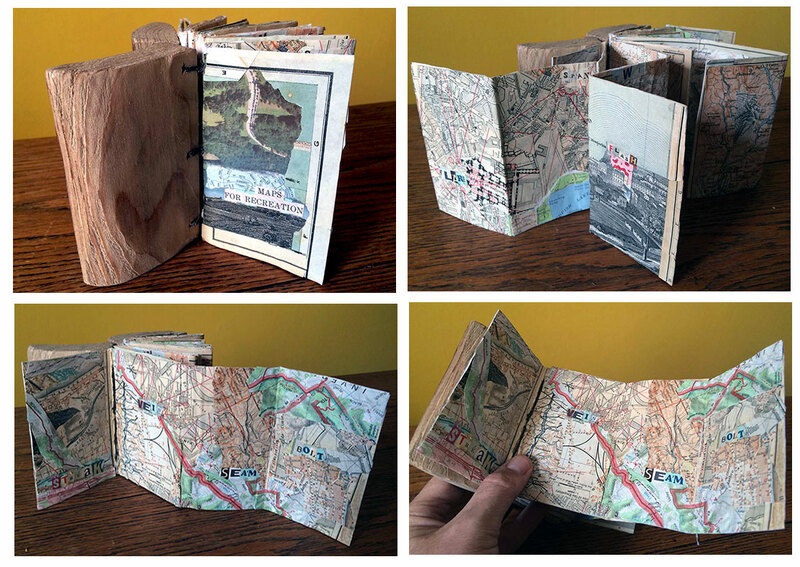 Map fragments collaged onto text pages from old travel guides. 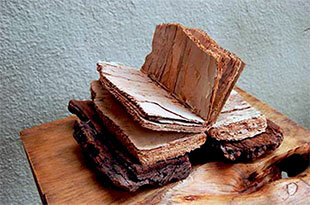 Wooden book boards. Sewn binding. Title carved into front board. Laid in heavy fabric wrapper with velcro closure. Signed and dated by the artist. Lauri Twitchell: "Hide and seek, a kids game played in many cultures, is a metaphor for how we wander through the world, actively searching for something or sitting back to see how things unfold. 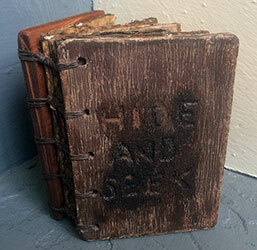 Synonyms for 'hide' and 'seek' are found along a path under stone tracings with maps attached as you travel through the book." Berkeley, California: Lauri Twitchell, 2018. One-of-a-Kind. 7" x 3" x 4.5" double sided accordion structure. Materials: Ebony, stone, ceramic, cotton, collage, wasp nest, rami. 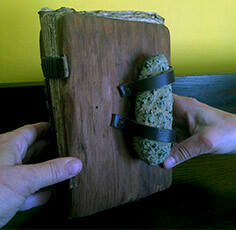 Bound in ebony boards with stone and puppet hand attached to front board. Puppet hand by Peter Suchecki. Laid in hand made wrapper with snap closure made by Suchecki. Book design by Lauri Twitchell. Dated. Signed by both artists. 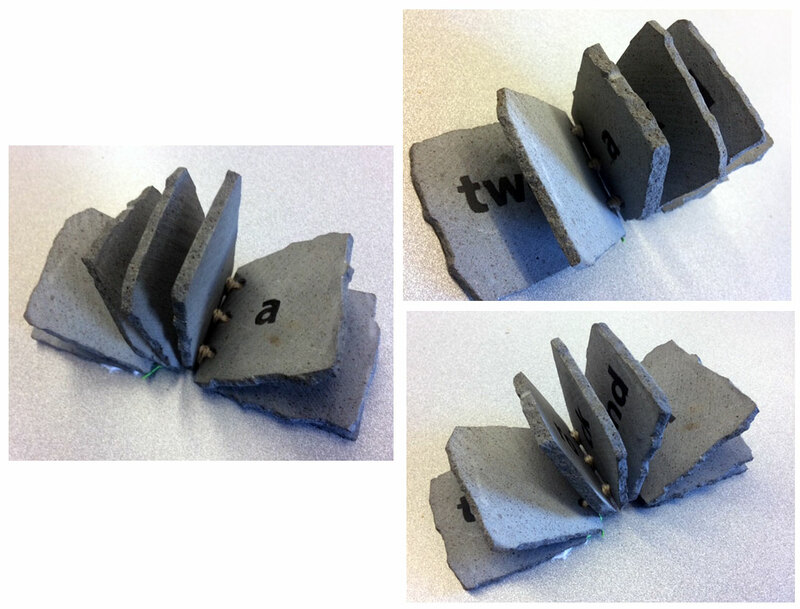 Lauri Twitchell: "This book started with a stone that I found on the shores of Lake Superior. I have been carrying this rock around for years in my car across the country, and in and around my house. Many have picked it up and tossed it: up and down; in hand; or held onto it. It's the perfect hand size. Puppet hands (also hanging around the house) came together with the 'doirneag' and then became the impetus for telling the story of this rock making waves as it was tossed back into the lake. Ripples are the story of its origin." 8" x 5.5" x 7.5" closed. Accordion structure. Materials: stone, leather, redwood, cotton, collage, ink, mortar. Found rock attached to front board. Back board with mortared rock base. Laid in custom wrapper made by Suchecki. Title machine stitched on wrapper. Signed by both artists. Dated. Lauri Twitchell: "It started with a pile of rocks mortared together that became the foundation for this book of synonyms for the poem 'rough language'." 5 x 7 x 9.5"; 31 leaves (verso blank). Collage. Materials: schist, leather, wood, hemp, cotton, ink, raw silk. Bound in found wooden board. Signed and dated by the artist. 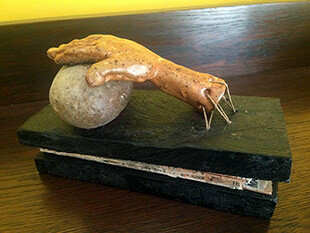 Lauri Twitchell: "Turning a rock around in my hands every angle reveals an interesting form. I trace around the contour of the rock and transfer it to paper and now it becomes a story of the rock tumbling around the page or through space. 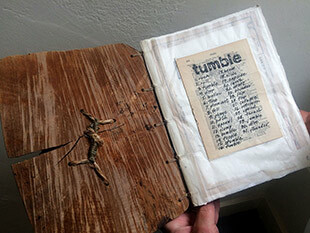 Synonyms for the word 'tumble' are collaged on each page with text and maps from old travel guides." Berkeley, California: Lauri Twitchell & Peter Suchecki, 2016. 4 x 5 x 10"; 40 pages. 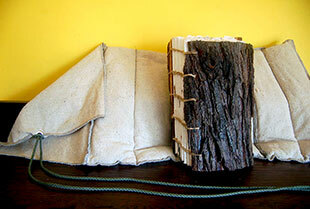 Materials: blackwood acacia, cotton, hemp, dirt, graphite, walnut ink, watercolor, raw silk. Handprinted text. In natural wood boards with coptic binding. Signed and dated by the artists. redstartstudio: "Looking for and using the most elemental materials seems to be a logical and an organic way to tell a metaphorical story in the natural world. 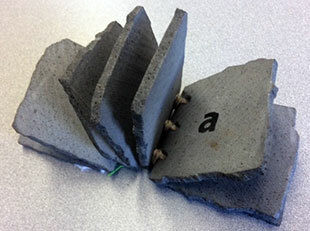 Landslide materials slide down the page and leave an earthen stain. 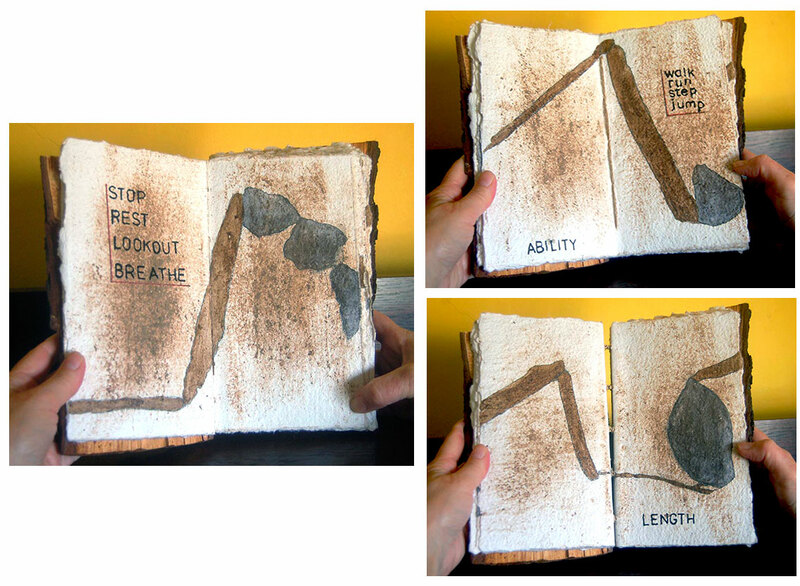 Later, sticks, and rocks found along a wooded trail are traced onto paper and a map of the experience emerges." California: Lauri Twitchell, 2016. One-of-a-Kind. 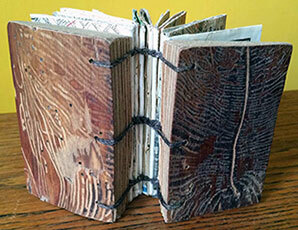 6 x 11 x7" bark pages bound in pine bark boards with hemp cord binding. 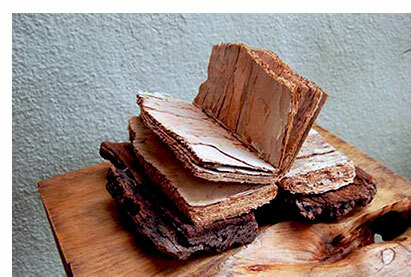 Materials: Melaleuca bark, stone pine bark, leather, nails, hemp. Berkeley, California: Lauri Twitchell, 2016. One-of-a-Kind. 3 x 3 x 3"; 8 leaves of slate. Materials: slate; acrylic, thread. Coptic bound. 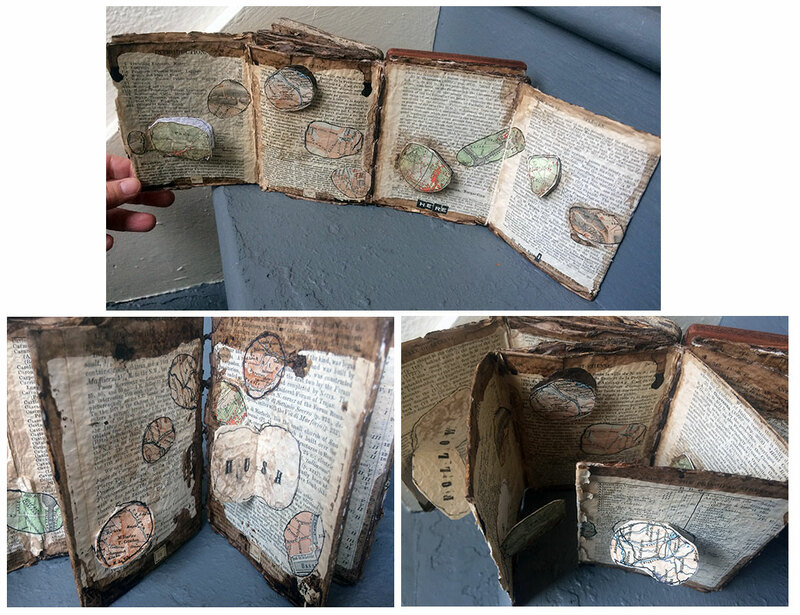 Laurie Twitchell: "A coptic bound book of slate pages describing a place that we often find ourselves in. "My work is informed by the natural world. Whether it is using text, sound, images, or objects, from/or about the land." 4.5 x 3 x 3" in wooden boards of redwood. Materials: handmade cotton paper, collage maps, thread. Coptic bound. Signed by the artist. Laurie Twitchell: "Inspired by the wood carvings by beetles revealed under a piece of redwood bark we thought about the fantastic journeys of insects. The book starts with the word 'roam' and continues with related synonyms." 4.5 x 3 x 3; 10 pages including 6 fold-out pages. 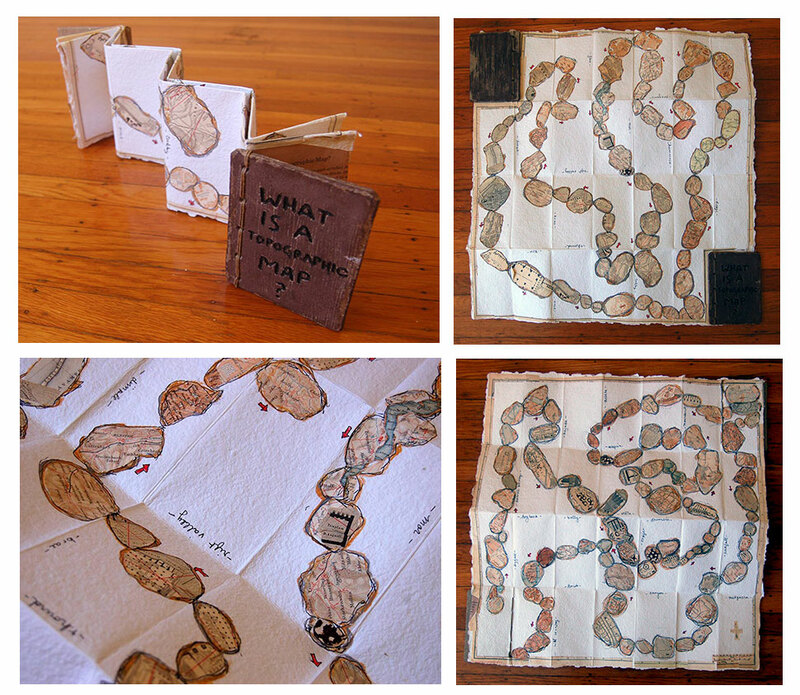 Materials: handmade cotton paper, collage maps, thread, redwood. Coptic bound in redwood boards. Laurie Twitchell: "A streak of lightening or a very fast path made by insects across a piece of redwood informed the text and images." 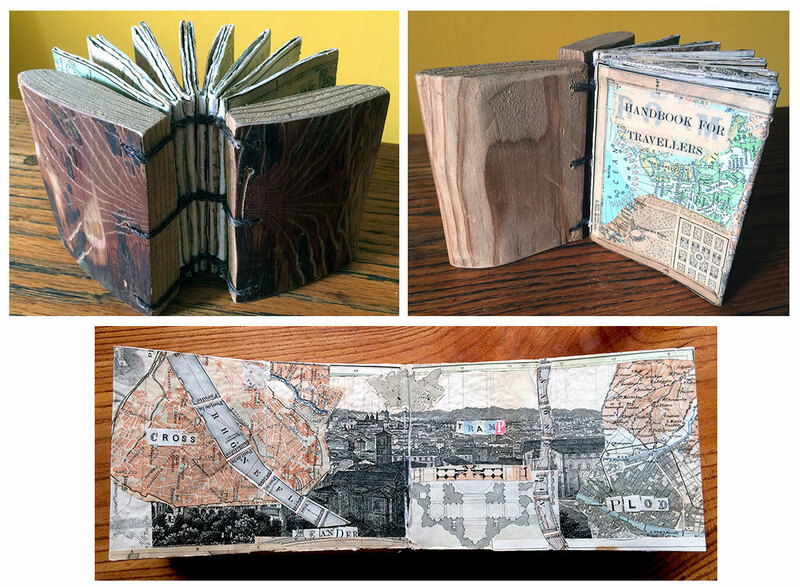 The pages are created from the maps contained in old Baedeker travel guides. 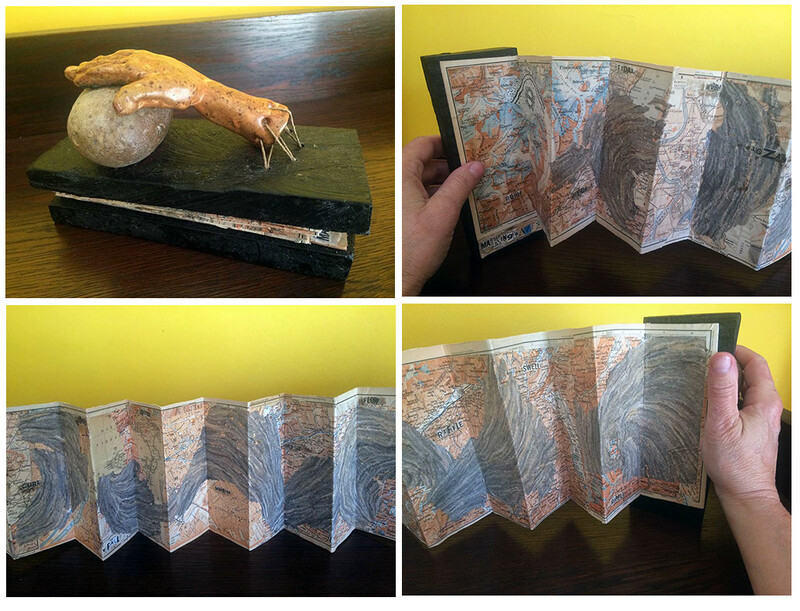 5 x 4 x 2" accordion fold. Materials: wood, linen, cotton paper, ink. Collage. Woodcut prints. Bound in wooden boards. Cloth wrapper with cord tie. Dated and signed by the artists. Lauri Twitchell: "Starting off making woodcut prints of insect trails found inside of downed trees I thought about landscape travel and scale. 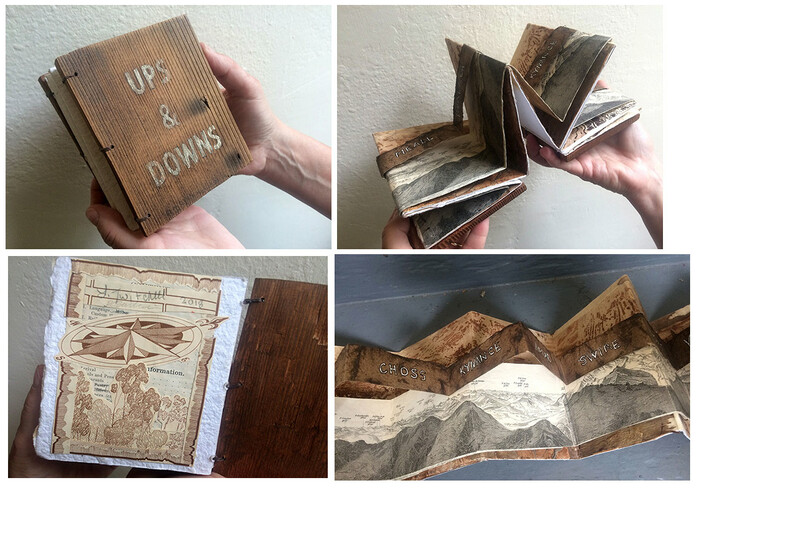 I collaged old travel guide maps and added images of panoramic views of mountain ranges and then a third page, a list of words that refer to peaks and valleys from Robert MacFarlane's book 'Landmarks.'" Berkeley, California: Lauri Twitchell & Peter Suchecki, 2017. 6 x 4 x 2"closed, extends to 21 x 22"; double-sided one sheet fold out. Collaged maps. Materials: maps, paper, ink, jute, pencil. Handwritten text. 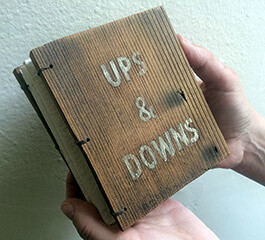 Sewn binding with ceramic boards. Signed and dated by the artists. Laid in a cloth wrapper. 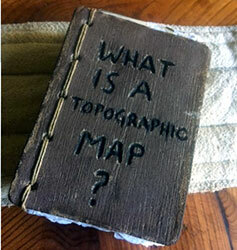 redstartstudio: "'What is a topographic map?' folds out into a two-sided map that contains a drawing of rocks collected from many yearly walks and hikes. The rock path is filled with a network of mapped locations we have been or places we will go. Hills and valleys are encountered and necessarily navigated throughout the journey."